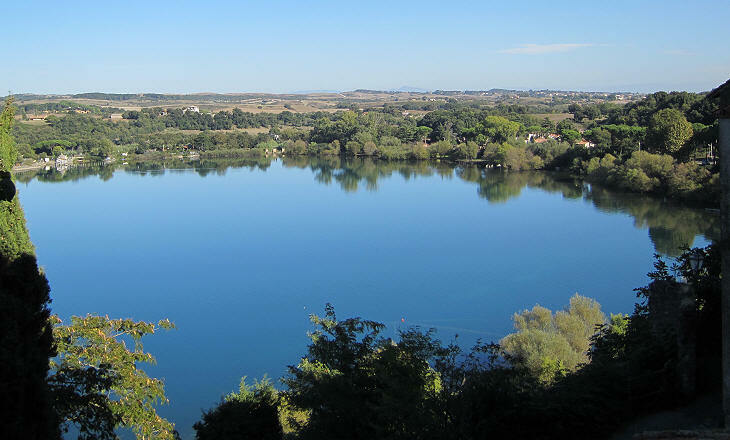 If you came to this page directly, you might wish to read a page on Bracciano first. 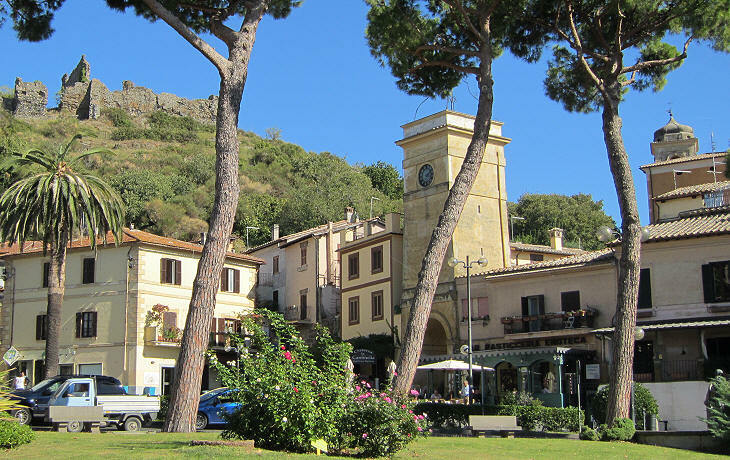 Trevignano is located on the northern shore of Lake Bracciano; the town was built on a small promontory which could be easily fortified. 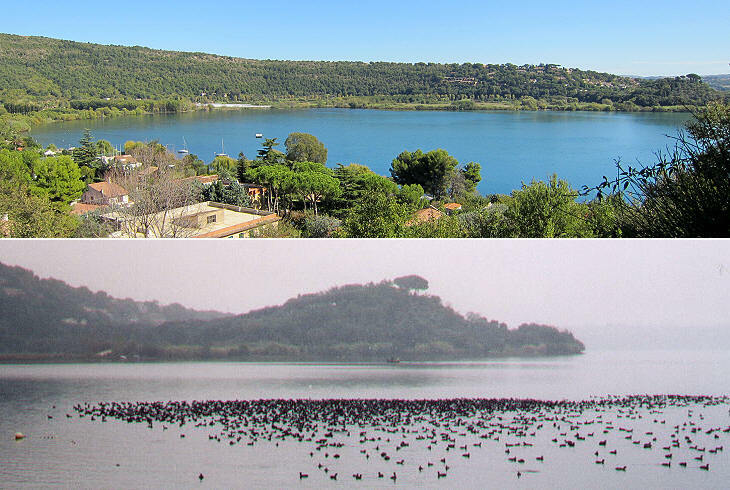 Today many Romans have built their second homes in the area to the west of the town because of its southern exposure, but in 1870 when Ferdinand Gregorovius visited Bracciano, the shores of the lake were marshy and very unhealthy. 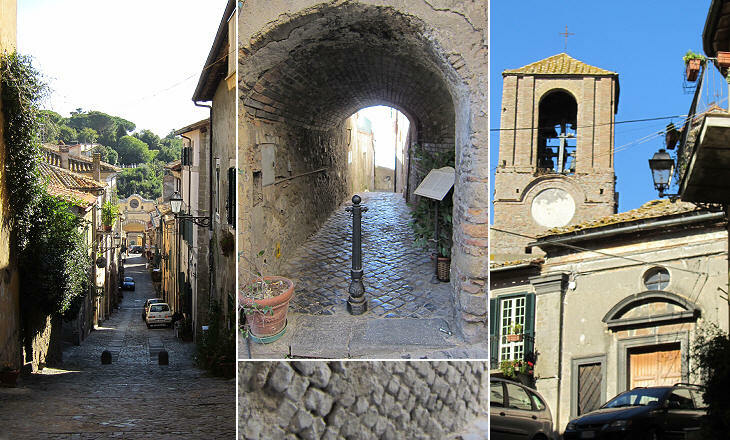 Trevignano is a very small settlement; it was surrounded by walls and it had two gates, one of which (Torre dell'Orologio) is still the main entrance to the historical section of the town. 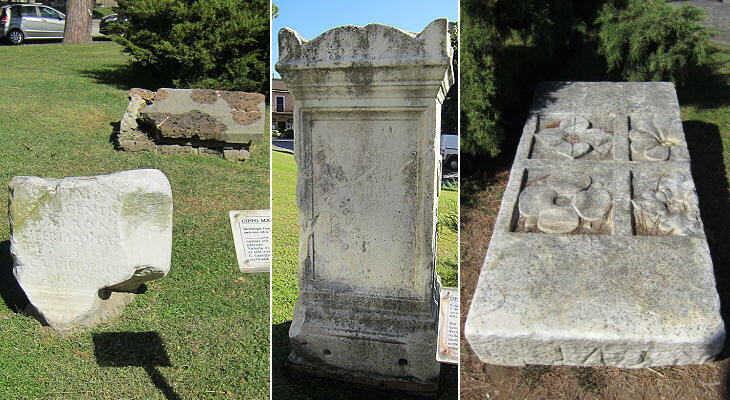 During the Ist century BC wealthy Romans built villas on the shores of Lake Bracciano, an added attraction being the presence of some hot mineral springs (Aquae Apollinares Novae) which are still utilized for the treatment of arthritis; Trevignano was built on top of one of these villas and sections of ancient walls have been identified inside some medieval buildings. The area around Trevignano was the starting point of Aqua Traiana an ancient aqueduct which was repaired by Pope Paul V and which is best known as Acqua Paola. 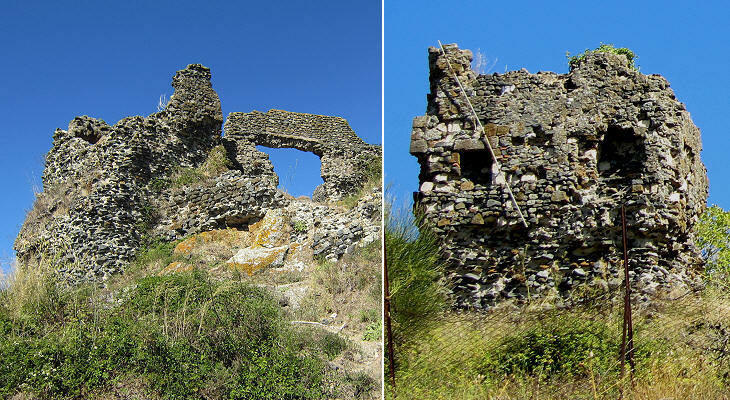 Trevignano is dominated by the ruins of a castle built in the XIIIth century and named after the Orsini who acquired it in 1378. 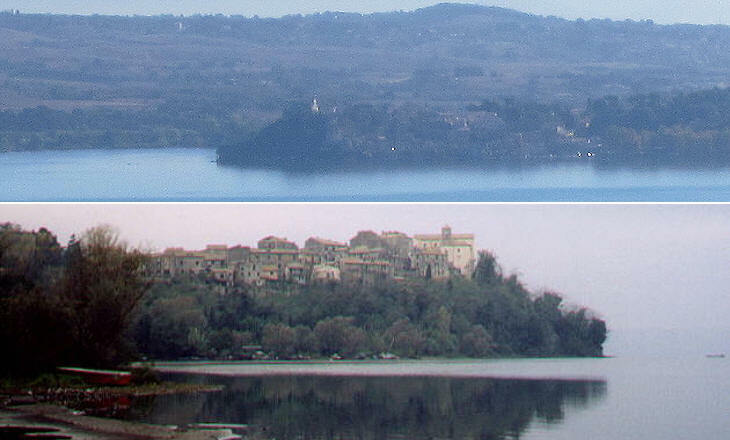 It was extensively damaged towards the end of the XVth century when the sons of Pope Alexander VI attacked the Orsini possessions around the lake. The parish church of Trevignano was renovated in the XVIth century by the Orsini. In 1693 Trevignano was sold to the Del Grillo, a family who owned a palace near the Forum of Augustus. One of the reasons behind the financial ruin of the Orsini was extravagant spending by Anne Marie de la Trémoille, the young and beautiful wife of Duke Flavio Orsini. 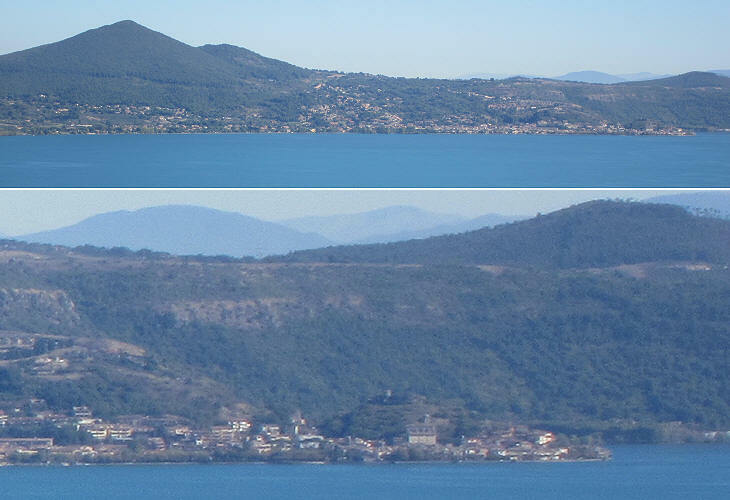 Trevignano is adjacent to a circular bay which was created by the collapse of a secondary crater of the volcano which gave origin to Lake Bracciano. 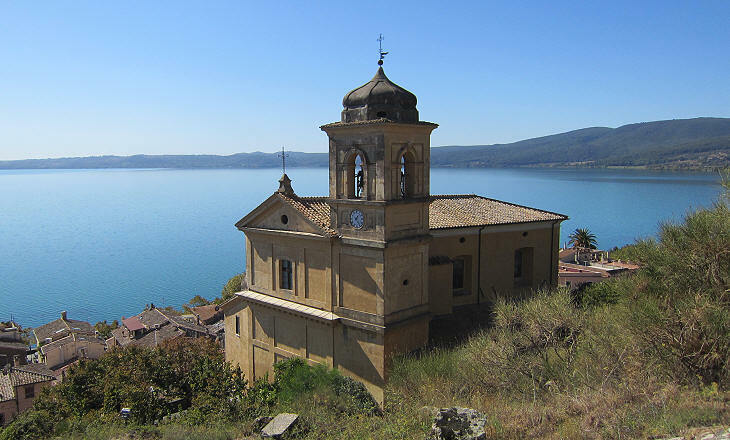 On the second day of his stay at Bracciano Gregorovius decided to walk to Anguillara along the edge of the lake; the excursion however was not completed because the town was not as near as it seemed when seen from Bracciano and the day was hot; after having rested at the shade of a grotto by the lake Gregorovius retraced his steps. Today Anguillara can be easily reached by suburban trains from Rome and because of this it has a large population of commuters who live in modern buildings near the railway station. The historical part of the town is untouched, but rather desolate because it is no longer the centre of community life. In his account Gregorovius mentioned Everso, Count of Anguillara, who during the middle of the XVth century controlled many towns north of Rome and possessed a fortified palace in Trastevere. 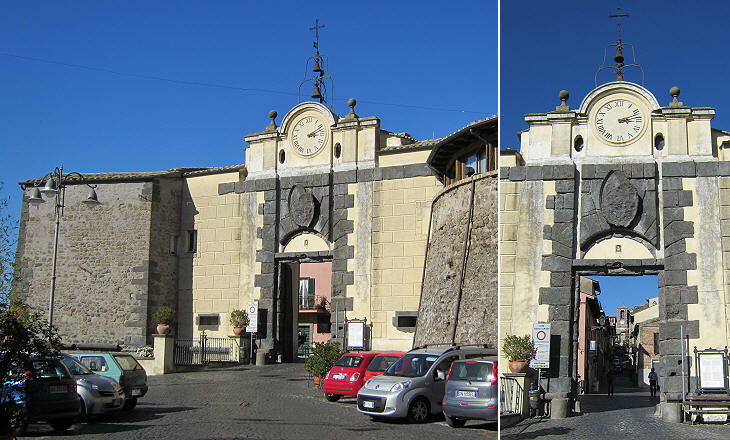 In 1492 Anguillara was acquired by the Orsini and its main gate was redesigned during the following century; it is thought that the (erased) relief above the entrance portrayed a bear (It. orso), the heraldic symbol of the Orsini. The official name of the town is Anguillara Sabazia; the epithet Sabazia was added in 1872 to distinguish it from another Italian town by the same name near Padua. Sabazia is a reference to Lacus Sabatinus, the Latin name of Lake Bracciano. Similar to Trevignano, Anguillara was built on the ruins of ancient Roman villas, such as that belonging to Rutilia Polla, a Roman matron of the time of Emperor Trajan, who is mentioned in Justinian's Digest (a VIth century compilation of Roman law) for having bought fishing rights in the part of the lake near Anguillara. The reason why the matron was mentioned in the Digest is that the level of the water in the lake rose some years after Rutilia Polla bought her rights and Roman law experts had to decide how these were affected by the change. Two eels (It. anguilla) are the symbol of Anguillara and many think the town was named after them, while the origin of the name is due to the angle made by the coastline at that location, because of a secondary crater of the volcano. In 1776 a fountain decorated with two bronze eels was built near Porta Maggiore. 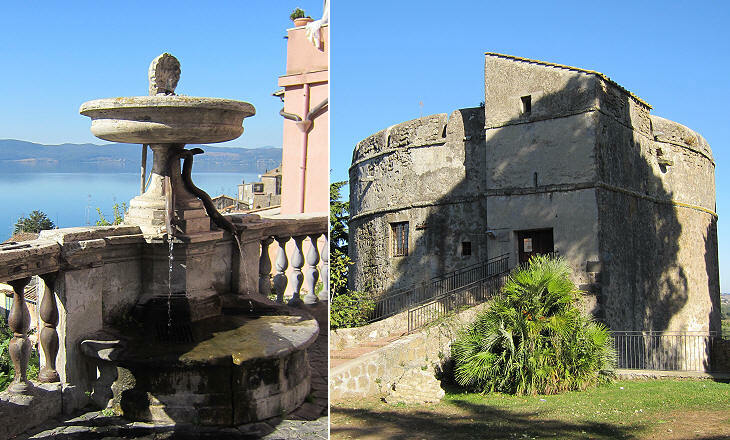 The entrance to Anguillara is protected by walls and by la Rocca, a large circular tower. Similar to Trevignano, Anguillara was sold to the Del Grillo in 1693.